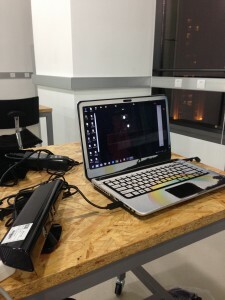 This is a lab about Kinect. 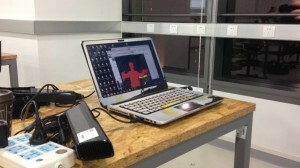 It uses its camera and sensor to capture people’s gesture and get a general outline of a person’s arms and legs. This a photo of Kinect. Connecting Kinect with Windows PC didn’t take a long time. But it takes time to download the developer software and library. Then Tiffany and me started to play with Kinect. At first it couldn’t recognize us because the distance was too short. This is a picture of William and Michael who sat in front us. You may see that it has some difficulty in recognizing people who sits still. Thanks Tiffany for performing the dance. Kinect is a motion sensing input device. It enables users to control and interact with their computers without the need for a game controller. 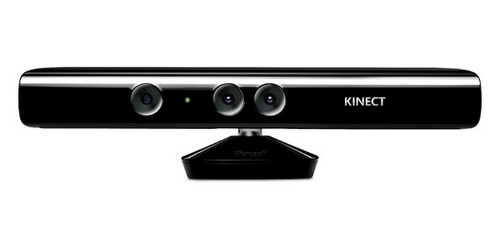 This is a picture of Kinect downloaded from the Internet. As it doesn’t work for Mac, I watched my partner,Ariel, to operate it. 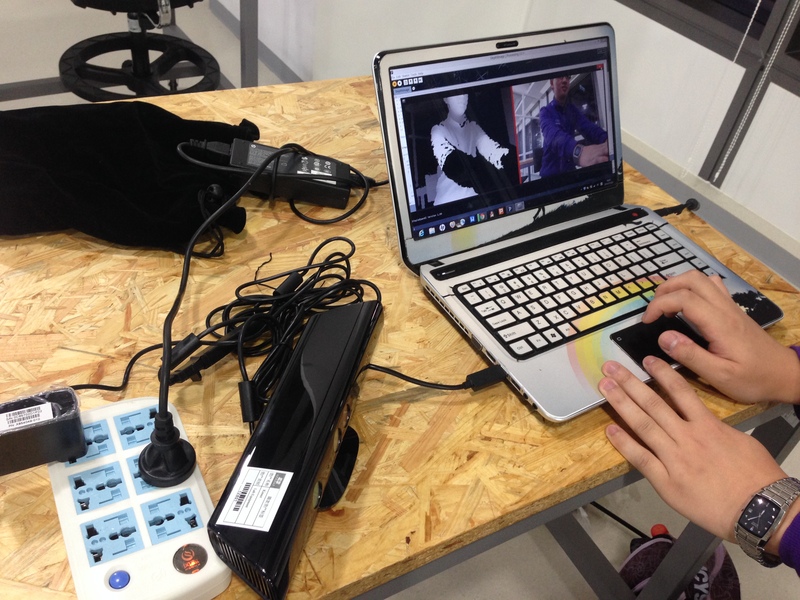 It seems that we need to download Kinect SDK 1.8 and Processing SimpleOpen NI library to make it work. 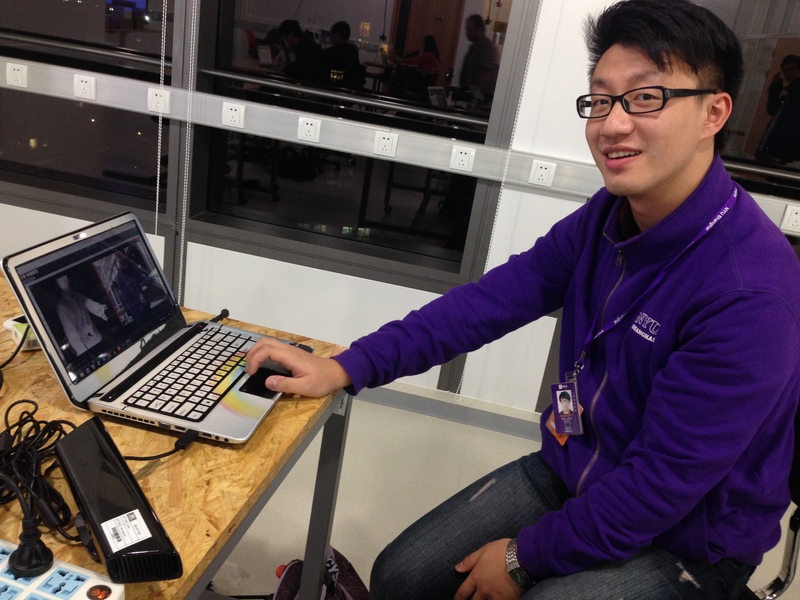 This lab teaches us how to make and play images, audios and videos in Processing. 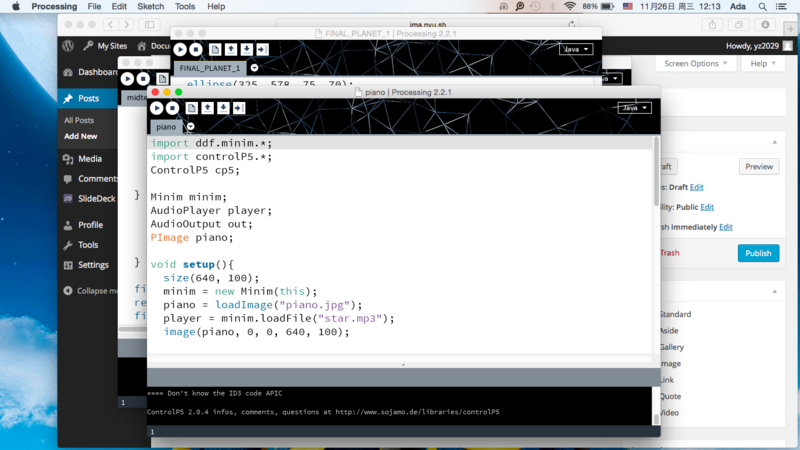 In the lab 11, I used minim library and controlP5 library to make a piano. You can listen to the music when you press the play button. Then, you can try it yourself with key a s d f g h j on the keyboard. 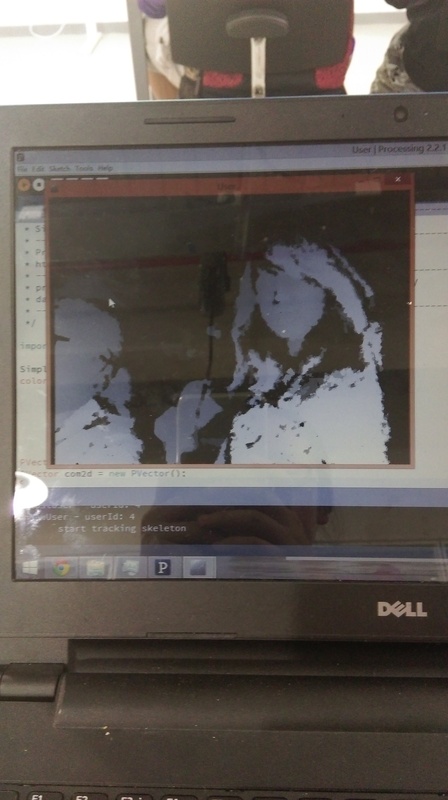 I just found I forgot this lab… This was supposed to be a parking game, you use wasd to control the car and put it into the parking lot without touching the white line, however I’ve not written the judgement of winning so it’s basically just moving the car around… Here’s the code! 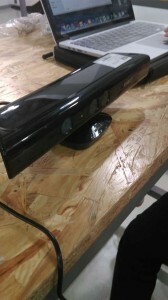 Today I experimented with Microsoft Kinect. It was a success fortunately. 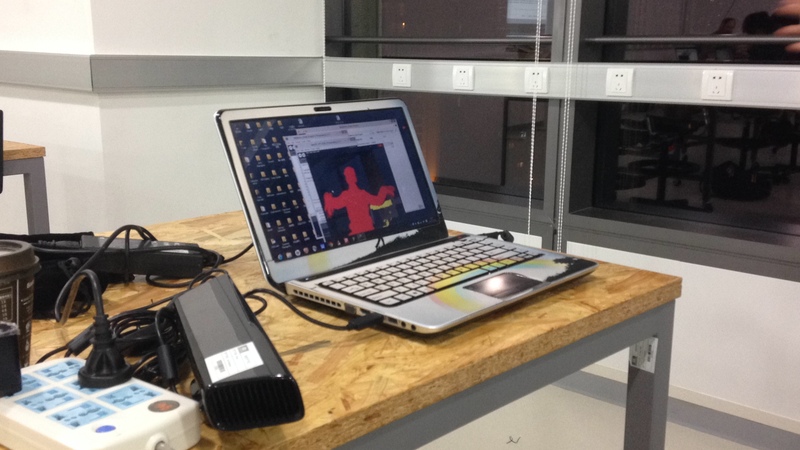 So in order to make it work, I had to download Kinect SDK 1.8 and Processing SimpleOpen NI library. I chose one of the examples from the library – “user” to see how it works. 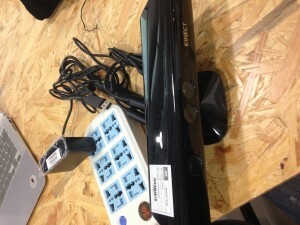 So this is what a Kinect looks like. This is the “user” example. I decided to add a bit more flavor into this project by combining Minim with the existing code. Basically what I did is add the following code. This is a video of me dancing to the music. Enjoy. My mind was kind of occupied by my final so I was not very creative in class today.. Since I’ve used minim to play audio in my midterm, I decide to make some sound with it this time 🙂 It’s really easy code by the way. This our project for today’s lab. Today’s topic is about image&audio&video. We combined image and audio together. In the video, you can see the original picture at the bottom of the screen. What we did it to use mouse to draw a pixel picture of it. When moving the mouse, you can get new pixels and there will be sound of the SINE wave. Today Kate and I double-dipped. Our final project will include the intersection between light and music. 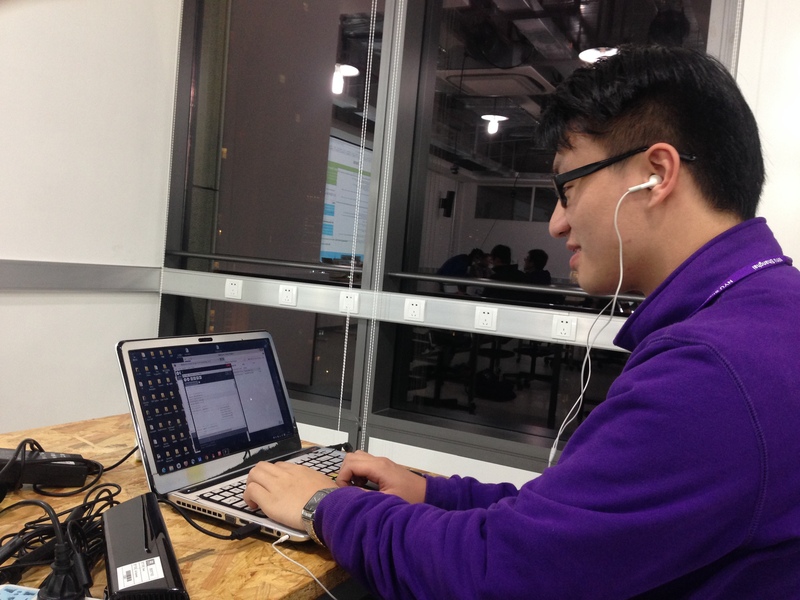 Utilizing the Maki-Maki we programed the Arduino to play different notes in unison with the keyboard. Eventually we will like to create a circuit using the Maki-Maki so that the noise produced will be a direct response to touch. // Prints out the available serial ports. // printed by the line above). // Arduino (in double-quotes), as in the following line. // Set the Arduino digital pins as outputs.